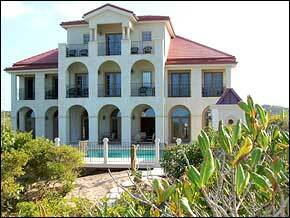 Located at the western tip of Grace Bay beach, on Providenciales, you will find Beach Villa Paprika. Constructed in 2005, this villa offers the ultimate in luxury. With 5 equal master suites, each featuring one or two King sized beds, the villa can comfortably accommodate 10 adults. All of the interior rooms are spacious and feature Italian tiled floors, beamed ceilings and air conditioning. The ground floor comprises a large and fully equipped kitchen, dining area for 10, comfortable lounge area with entertainment centre, plasma TV, DVD player and high speed internet connection. French Doors open onto the pool deck and patio area with shady gazebo, BBQ area, large heated pool and separate kiddies pool. The patio area is contained within a decorative wrought iron railing with gated access to the soft white sand of Grace Bay. On the ground floor you will find one of the 5 master suites, each complete with large fully tiled bathroom, TV and Air Conditioning. All suites have an ocean view and access to patio or balcony. The remaining 4 suites are situated on the first and second floors of Beach Villa Paprika.